Our Vision: Be recognized globally as the leading company in reducing the cumulative carbon foot print of laboratories, and increasing safety of workers in the laboratory and workplace environment. CP Lab Safety is a federally recognized Woman Owned Small Business (WOSB), Bay Area Green Business, Disadvantaged Business Enterprise (DBE) and California Small Business certified manufacturer of environmentally conscious laboratory safety products and distributor of leading lab supply brands. Our goal is to make businesses and laboratories safer so that workers can stay healthy and work more productively. CP Lab Safety was awarded a GSA Schedule 66 Contract (#GS-07F-238AA) in 2013 in order to further grow its business relationship with the US governm ent, though it continues to serves businesses and individuals across the globe. Through an extensive portfolio of more than 65,000 laboratory safety products, CP Lab Safety is helping labs to reduce their emissions of waste into the air and water, reduce the risk of fire, and reduce workers’ exposure to toxic fumes. Dr. Ron Najafi founded CP Lab Safety in 1996 in the basement of his San Francisco home, with the help of his wife Kelly Farhangi Najafi. A chemist with an entrepreneurial spirit, Dr. Najafi had an idea for a simple product that would reduce emissions from open waste containers in laboratories. As a chemist and member of the safety committee at his company, Dr. Najafi had become sensitized to the growing problem of laboratory fumes escaping from open waste containers. In an experiment, they determined the emission levels from waste containers left open in their lab. It became clear that volatile fumes evaporating and spreading throughout the lab at unacceptable rates. To address this issue, Dr. Najafi developed a uniquely designed funnel with a long tube and a lid that screwed securely onto a solvent bottle. Thus was born the First Generation ECO Funnel and the company CP Lab Safety (originally California Pacific Lab Safety). Since then the ECO Funnel has gone through two design changes and is now in its Third Generation, which incorporates a latching lid with an inner gasket that prevents 99% of chemical emissions from escaping. It is widely used in educational, pharmaceutical, chemical and biotech industries. Today, CP Lab Safety manufactures a line of more than 80 different ECO Funnels and Systems, designed in various sizes and specifications to accommodate a growing roster of customers. 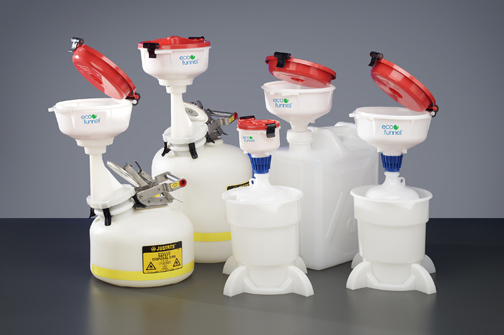 CP Lab Safety offers thousands of lab and industrial safety products, including an array of secondary containers, chromatography funnels and solid waste containers. The company’s entire product line is sold across the United States, Canada, Europe, Australia and Asia by the industry’s most well-regarded distributors, including Lab Safety Supply, VWR International, Grainger, and Fisher Scientific. 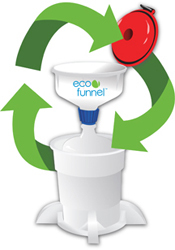 The third (and most recent) generation ECO Funnel has been re-engineered with some significant enhancements, including a positive latch, a gasket to help reduce evaporation, and a filter to keep out stir bars and other solid wastes. 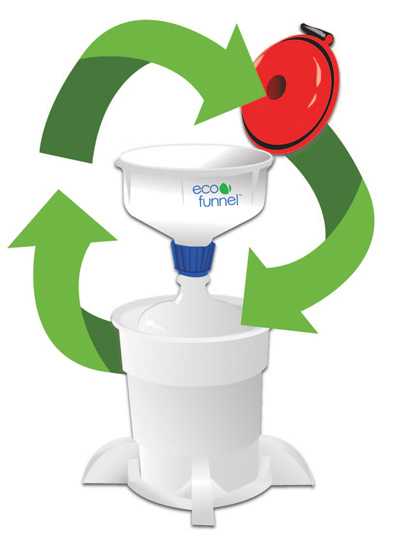 New ECO Funnel designs also enable the product to handle waste generated from HPLC machines. After 7 years of manufacturing in China, CP Lab Safety has returned its manufacturing to the United States. The company’s ECO Funnel and other products are now “Made in the USA” at a manufacturing plant close to its corporate headquarters in Novato, Calif. The move allows CP Lab Safety to be more efficient and even more responsive to its customer's needs, and it helps promote their company goal of Making Science Green®. CP Lab Safety’s products are instrumental in helping laboratories maintain compliance with federal and state regulations regarding clean air, exposure to hazardous wastes, secondary containment, and fire safety. CP Lab Safety consistently strives to exceed our customers’ expectations of both product quality and customer service. CP Lab Safety’s highly trained customer service representatives work hand-in-hand with our customers to determine the best products for their needs. CP Lab Safety’s commitment to a healthier environment doesn’t stop with the laboratory. We believe strongly in making our Earth healthier and more sustainable for generations to come. That’s why we’re making a concerted effort to reduce our own carbon footprint and support others who strive to clean up our planet. In 2016, CP Lab Safety was honored with an Environmental Stewardship Award from Congressman Jared Huffman in recognition of their sustainable efforts. 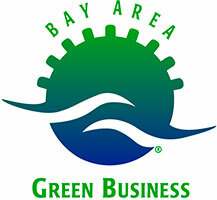 As a Certified Bay Area Green Business, we reuse what we can and recycle what we can’t. We’ve reduced our wastes 75 percent by making simple changes in our procedures, such as shipping our products in recycled boxes, emailing invoices and offering our catalog on CD. You’ll find lots of natural light and high-efficiency fluorescent lighting in our headquarters. What you won’t find are electronics left on when we leave the office. And our return of manufacturing operations to the United States from China further reduces our carbon footprint. You can call us at (888) 322-5722 if you'd like to learn more about CP Lab Safety, or you can email us. We enjoy hearing from our customers!